Peaceful. Tranquil. Serene. How great is it when we are truly at peace? Last year, before my co-worker passed away, I walked in Tyler State Park every afternoon at lunch time. Things got pretty hectic after she passed, and I was not able to continue my routine. I think about her a lot, and hope that she is at peace. She should be, she was an extremely peaceful person. Peaceful is a way of life along with a state of mind. I was looking around for peaceful places and found an article called The Ten Most Peaceful Places to Live on Earth. There are some beautiful photos in this article along with some exotic locations. Canada is in there. Not sure how exotic Canada is (no offense!) but it is definitely on my “places to go” bucket list. I have read and heard that Canada is amazing. I really want to see a moose. Ok, that was random, but wildlife brings me a sense of inner peace I find it difficult to explain. My favorite place these days is my backyard. (See the linked piece for a sample–two chairs under the huge old oak tree.) When we lived in a small Lake Travis community, it was the lakeside picnic cabanas early in the morning. 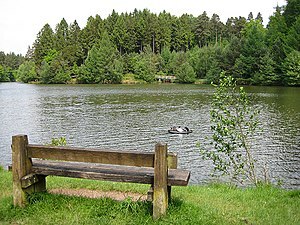 I was usually the only one there–except on weekends, when Sherry was with me–and the lake is so still in the morning, with the occasional fish jumping and smacking back to the water. I still go there in my mind. When I really need some down time, I hit the beach. I’m only minutes away and there’s something about the surf and the salt air that does wonders for my mood. oh you are so lucky to be so close to the beach! My sister is and every time I go see her, we take a nice walk down to the beach. So awesome for you, k.
I can find peace at home, as long as I’m home alone. LOL Another great place is in the Upper Peninsula of Michigan (which is where I live)…and there are Moose up there …far, far north. It’s beautiful country and so relaxing. Time seems to stand still. I love Moose! One of my life’s goals is to travel to other places and see other creatures.. especially the Mighty Moose..
I’m with Christine–love when I’m the only one home (and my home is visually peaceful, as in ordered and uncluttered). Any of nature’s offerings work too. Sometimes it’s as simple as the wall of sunflowers in my garden (with my chair angled away from the clutter my small yard tends to gather) or a bench at the park down the street. The porch at my cottage works too. ooh, you have a wall of sunflowers?? I love it!! Thanks for sharing, Joanna. Canada’s a huge place. From crazy nasty cities, to amazingly empty wilderness areas. If you want culture, they have it, if you want mountains jumping straight up out of a plain, they have that too. I can feel peace in a lot of places. Nice post. sounds like Canada is my kind of place.. 🙂 Thanks for stopping by, Mimi. I go within, into the light in my heart. I stay there, until I am renewed enough to venture out again. I like to think I’ve acquired the ability to be at peace wherever I am at the moment. My struggle now is to recognize when I need to do that. This looks like one of the spots I go to relax in. I find peace inside myself, and if there is a reason where that is not possible, it’s near impossible to find it in any other place either. I do like to feed the relaxation hunger some though with watery places, and green places. Beautiful spot you have there!